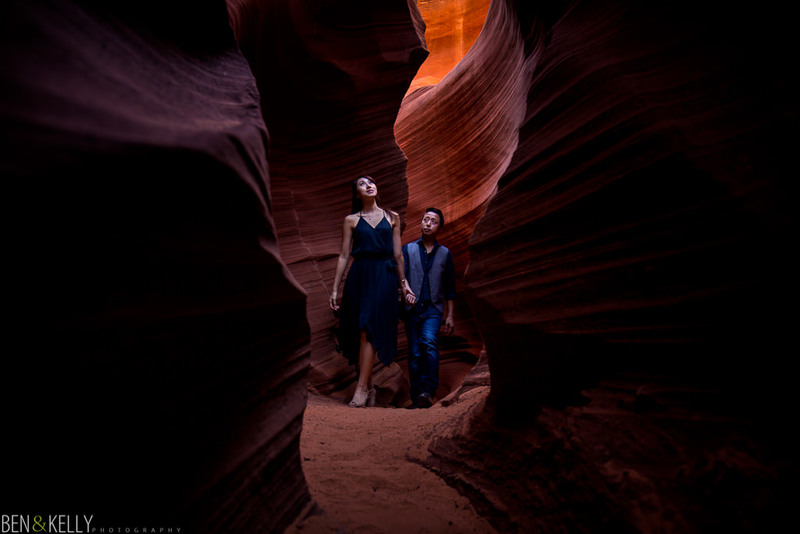 Kelly and I love photographing new places, especially when adventure is involved. 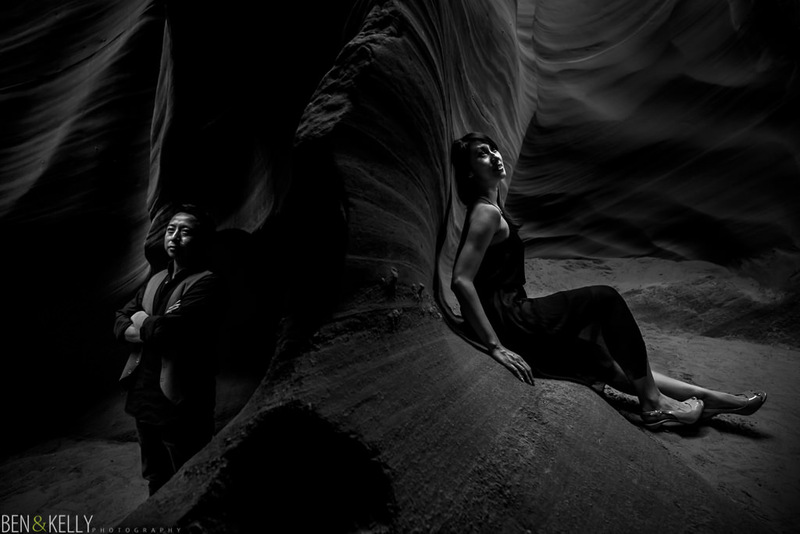 So, when Shirley reached out to us and said her and her fiancé Gerald were flying in from Hong Kong and wanted us to photograph them at Horseshoe Bend and Antelope Canyon, we jumped on the opportunity. 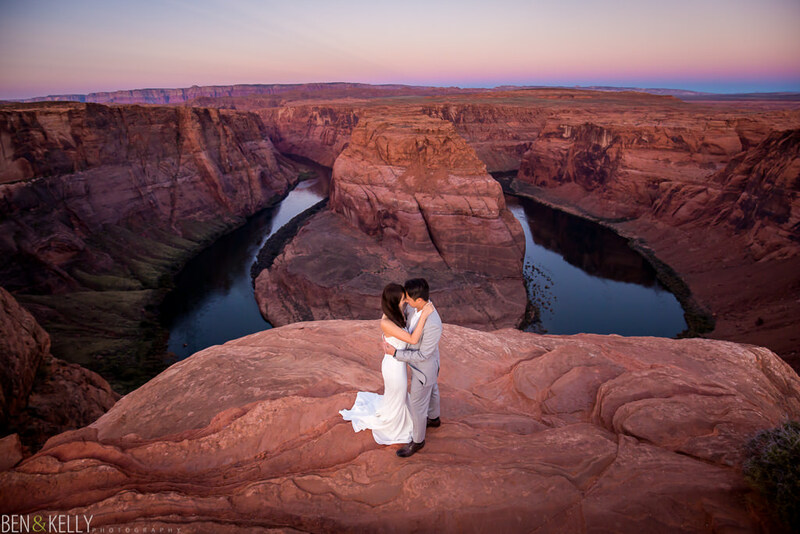 We chose to start at Horseshoe Bend at sunrise. 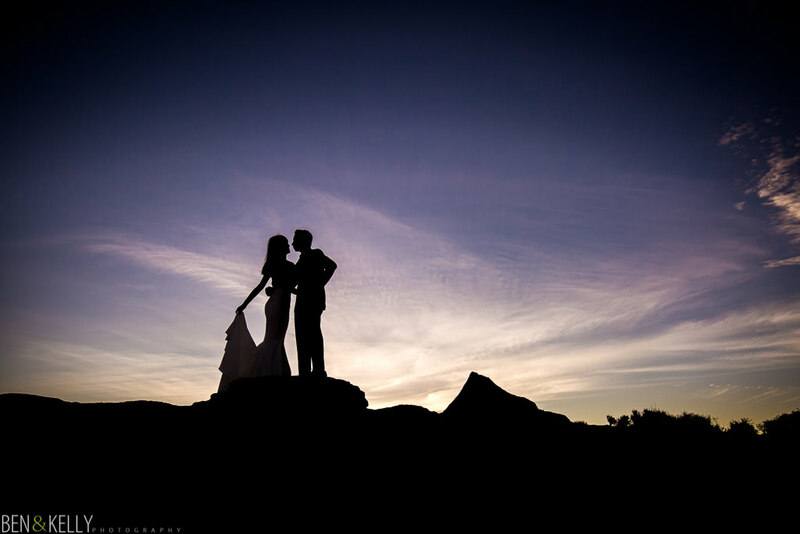 It was a frigid 38 degrees, and we got there a little before first light to make sure we could get our couple in a clearing before the hordes of landscape photographers arrived. If you’re not familiar with Horseshoe Bend, it’s an overlook of the Colorado River just above the start of the Grand Canyon at Lee’s Ferry. I’ve been on the actual river looking up at the cliffs dozens of times, but this was our first time being on the cliff looking down. It’s a long way down. Especially for me being terrified of heights. Kelly had no problem. Neither did Shirley or Gerald. 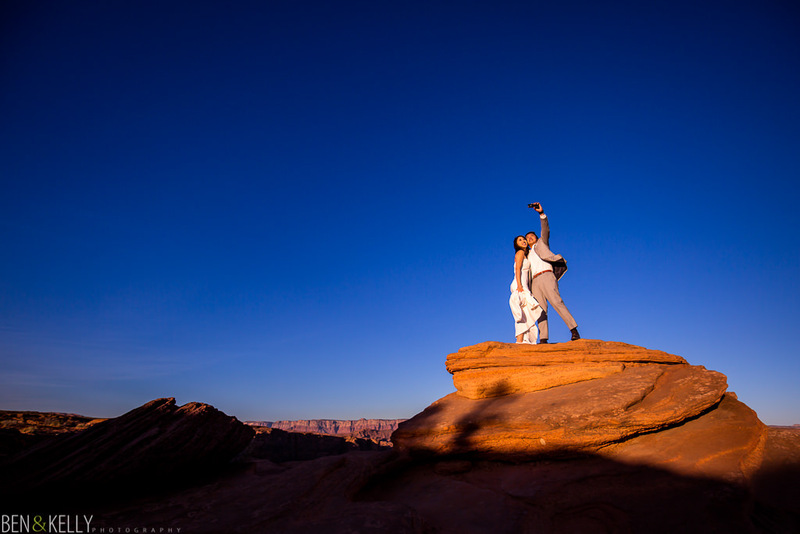 So…we told Shirley and Gerald to walk to the edge of the cliff and we took some photos. No need to re-create the wheel or get fancy when the universe gives you something so beautiful. It’s a magical place to watch the sunrise. 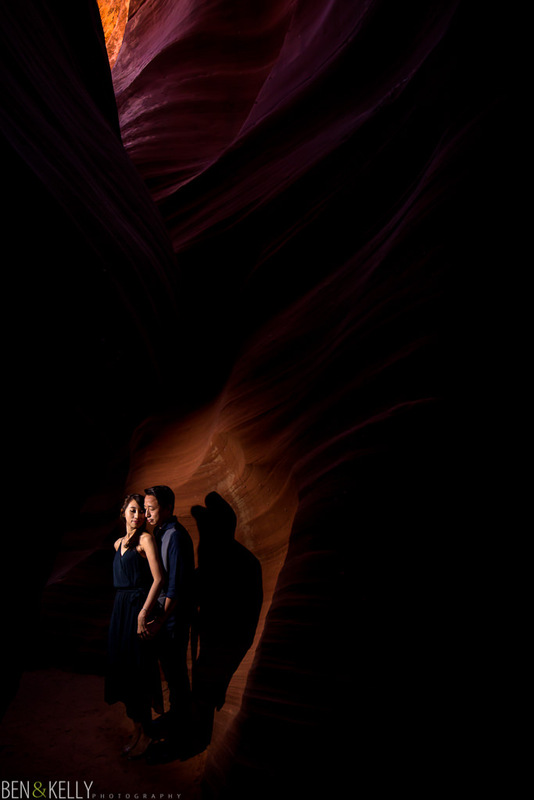 And to photograph a brave couple who shivered through it was amazing. We loaded up and headed to a small slot canyon called Rattlesnake Canyon. 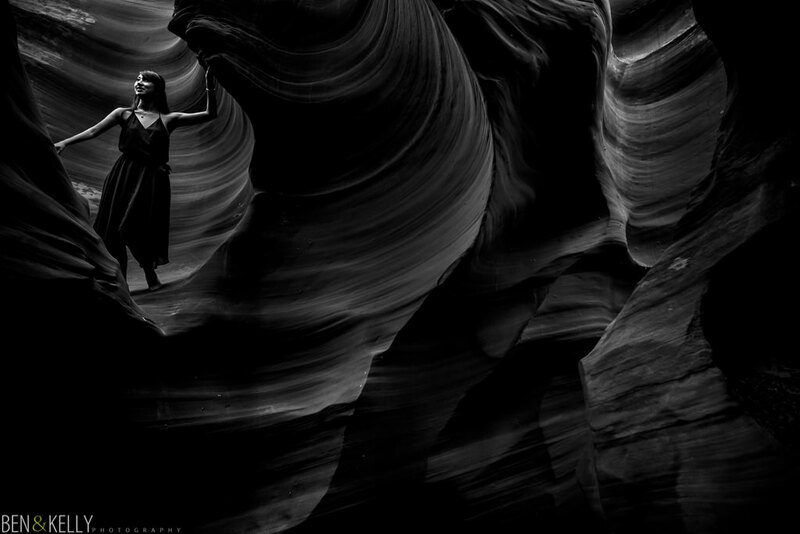 This is a smaller version on Antelope Canyon. It’s much less known, and much less crowded. This gave us an opportunity to work with our couple and take our time before getting to Antelope. 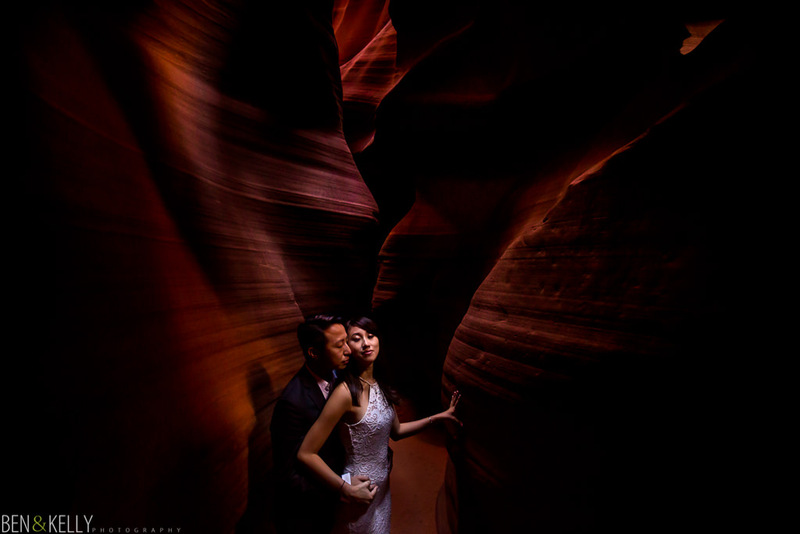 Our goal was to create images where our beautiful couple looked as if they were part of this beautiful canyon. 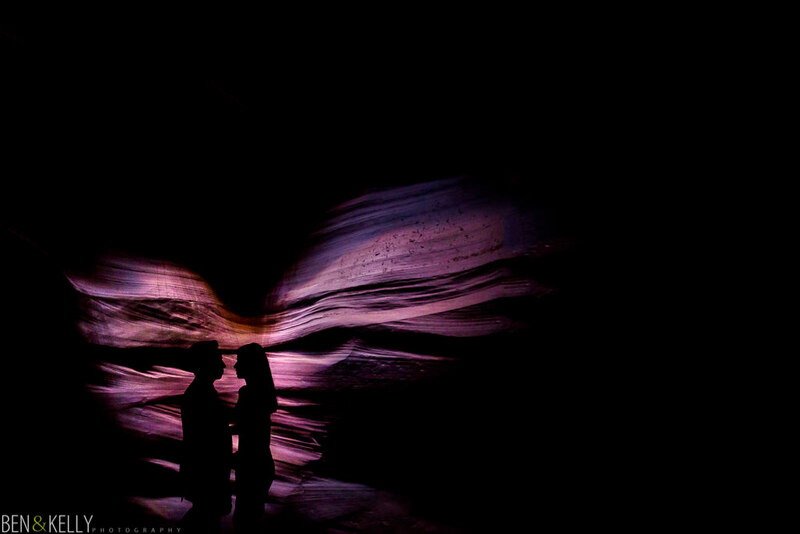 We finished our day at Antelope Canyon. This is one of the most amazing places we’ve ever been; truly breathtaking. However, it should be said that it is also the busiest and most crowded place we’ve ever photographed. It was worse than Disneyland. Literally hundreds of people crammed into a very narrow slot. So we had to be patient, and find our little windows of opportunity, and make something happen when we could. It was a little stressful, because we only had so much time to be in there, but Shirley and Gerald were amazing, and we had a blast.